The concept of followership, like leadership, is not new to the extent that it has been around since the beginning of creation. It is so pervasive in human interactions that attempts to study it are often met with ridicule. In the organization literature, followership, a complementary role to leadership, was often ignored until recently when scholars observed that followers have as much a role to play in the leader-follower relationship. 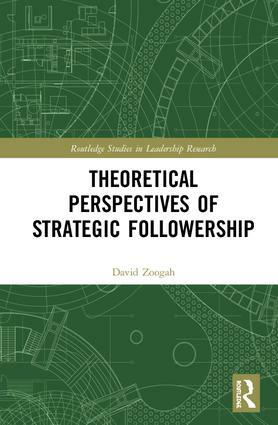 Theoretical Perspectives of Strategic Followership focuses on one type of followership – strategic – which is an emergent phenomenon. Similar to leadership, followership has been defined as a role, process, and capacity. Indeed, others consider it as socially constructed. In addition to the definitions, the relatively sparse literature has identified antecedents, outcomes, and moderators of followership. The book combines both the macro (strategic management) and micro (psychological) foundations of strategic followership to encourage research not only among strategic management scholars but also those in the micro fields of organizational behaviour, human resources management, and industrial psychology. Dr. David Zoogah is an Associate Professor at Xavier University, Cincinnati, Ohio, USA. Routledge are pleased to announce a new research series focusing on leadership. Designed for scholars and researchers within the field, as well as executives and administrators, it will reflect cutting edge international leadership research. Relevant to all aspects of business conduct for individuals and organizations, books in this new series will analyse emerging and critical perspectives on leadership research, and reflect the discipline from organizational and political perspectives as well as those of individual leaders such as CEOs.